I did not know that much about Nietzsche, or the context of his “God is dead” statement. But what I learned in my World Religions class made me stop and think about what he had said. I am a believer in Jesus Christ, and a different perspective this quote has actually strengthened my belief in God and the power of Jesus to change lives. Nietzsche could not see the power of the Holy Spirit working in the lives of Christians around him. He probably could not feel God’s presence or His spirit leading believers. Nietzsche did not even say that there is no God or that Jesus did not exist in this statement. He said that God died. Most of us have a hard time even considering the idea of God “dying” forever (after all, Jesus was resurrected). What Nietzsche meant is that God’s works were dying in believers. Sound familiar? If we take his statement in that context, then it is actually Biblical! Dead. Anyone can have faith in God, but showing His power and how it transforms us is what makes faith come alive. Verse 19 of that chapter says, “You believe that there is one God. Good! Even the demons believe that—and shudder.” If even demons believe that there is one God, then Christians should definitely show the proof in their lives that they are different. Now that does not mean that our salvation must require proofs or deeds, in fact, this passage does not even discuss salvation specifically. It is talking about faith, and showing your faith so others will see what Christ has done in you. If you have faith in God, and have been saved by Jesus, then your thoughts, words, and actions should change anyway. “Therefore, if anyone is in Christ, the new creation has come: the old has gone, the new is here!” (2 Corinthians 5:17). When we are saved, we are supposed to surrender ourselves and our old ways over to God so Jesus can fill us and we can become brand new. If Nietzsche was walking around and looking at “Christians” who were not fully surrendered to God, no wonder he did not see faith in action! 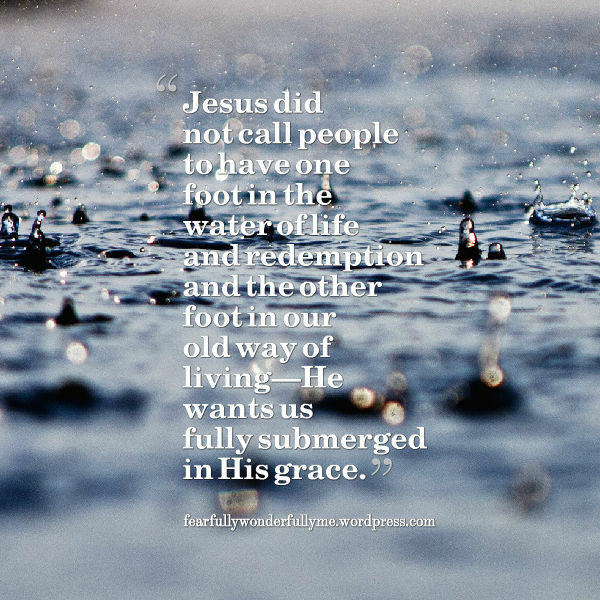 Jesus did not call people to have one foot in the water of life and redemption and the other foot in our old way of living—He wants us fully submerged in His grace. Although God’s light was within me, I was not ready for it to take over me and shine through. I think a lot of people are still like this; they believe in God and want what Jesus can give them, but they will not let go of their old ways. It is not easy. This past year, however, I found that even though this surrender is impossible for me to do alone, with God it can be done. My whole life has been radically changed. I have found purpose and identity that I never knew before. I have also found healing and forgiveness. The light within me is finally starting to shine through—God’s presence within me is finally being made known to those around me. Yes, there are a lot of people out there who carry Bibles, go to church, and call themselves Christians. However, they might not be fully surrendered to the grace and salvation of Jesus Christ. When Jesus called out the hypocrites of His day, these people were no different than the modern day hypocrites. We are all fallible humans in need of redemption. We do not need to be responsible to make God come alive—He can do that Himself through the workings of His Spirit. However, we need to let God move in us and accomplish these deeds of great faith. I guess the main question that every Christian must ask is: what does it mean to be a Christian? Romans 10:9-10 tells us that faith in Jesus Christ will make us Christians. The next biggest question that we must ask is: What does being a Christian look like? How can we have the faith that produces the good deeds to show that Jesus is alive and at work within us? We need to do more than just go to church and wear crosses around our necks. We must go the extra mile and submerge ourselves in God in order to make our faith visible. 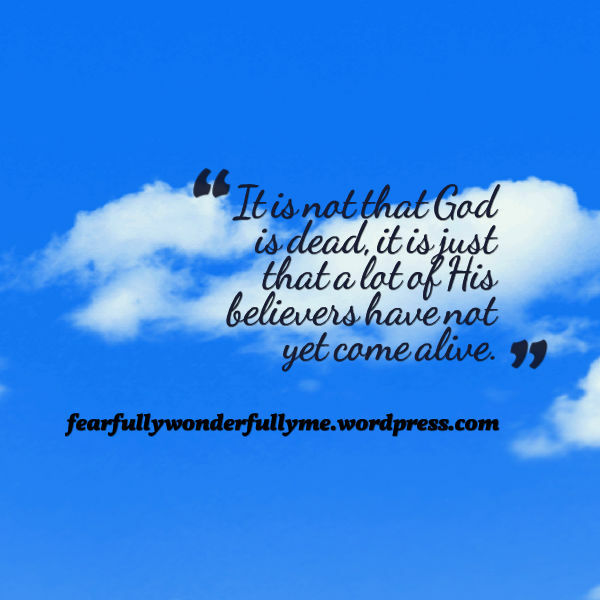 It is not that God is dead, it is just that a lot of His believers have not yet come alive.